Looking through a list of David Melling’s books on Amazon, it is striking that they all have five-star ratings. Melling is both author and illustrator of this delightful picture book. He began his career as an illustrator and then progressed to writing his own stories that were inspired by his drawings. The story centres around a goodnight kiss that is blown by a busy king (on his way to have a bath) to his young son. 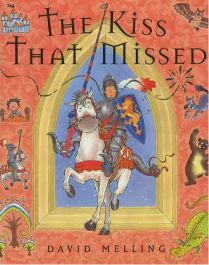 The kiss unfortunately misses the little prince and bounces out of the open window. The king orders his loyal knight to go in search of the kiss, so the knight mounts his trusty horse and they gallop off to the wild wood. This is a pretty scary place when it is dark, and our knight does not seem to be the bravest of young men. Luckily, the royal kiss comes floating by and calms all the wild creatures down. They settle down to sleep, so the knight and his horse decide to have a seat on what they think is an old tree trunk. They soon discover that they have in fact sat on a dragon who rises up and decides that the knight and the horse would make a good breakfast. Just in time, the kiss floats by again and makes the dragon sneeze. The knight and dragon seize their chance to escape, but the dragon of course is now utterly calm. He picks them up, kisses them goodnight and takes them back to the castle. The story ends peacefully and happily. One unusual aspect of this picture book is that the text sometimes appears on a white background independent of any pictures, and sometimes it is superimposed on a whole-page illustration. I particularly like the fact that some phrases appear in a larger font than others, and one phrase is in bold type. One or two words, such as ‘sneezed!’ are in a completely different font. It seems to me that, because Melling is primarily an illustrator, he puts more emphasis on the visual aspect of the text than other writers do. I find this very effective. The illustrations took Melling six months to complete, and that is not hard to believe. From the skinny, dragon-like creature on the first page of text that gives the impression of an illuminated manuscript to the final double-page spread of a happy family scene with the enormous dragon curling around, this is a feast for your eyes. The passage of the kiss is shown by a curling gold thread, and the wild creatures can be either scary or amusing. We see a close-up of the dragon’s face with the knight and the horse reflected in the pupils of his eyes, as well as panoramas of the wild wood at night where snowflakes fill the air and the twigs on the branches of the trees resemble fingers reaching out to grab passers-by. This is of course an ideal bedtime story, as it ends on such a tranquil note and shows the prince tucked up in bed. There is a wise message for parents here, about not being in too much of a hurry but finding time to spend with their children. I would say that three to six would be a suitable age range for this story. Confident five- to seven-year-olds would probably enjoy having a go at reading it for themselves, although I don’t feel that it was written with this intention. A fair amount of descriptive language is used, and phrases such as ‘galloped off it hot pursuit’ are not the easiest for emergent readers to tackle. For such a beautiful and enjoyable book, I don’t think anyone will feel that the price of £4.02 is a lot to ask. If you haven’t read any of Melling’s books aloud to your children before, I think you and they are missing out. I would recommend them to all parents of young children. No Comments on "The Kiss that Missed"